In the quest to unlock the secrets of the physical world, science has revealed fundamental truths, devised solutions to age-old problems, and posed challenging new questions. The treasures here include some of the key discoveries and developments that have shaped the history of science in American life. While they are products of careful observation and experimentation, they often have had unexpected impacts far beyond the laboratory. 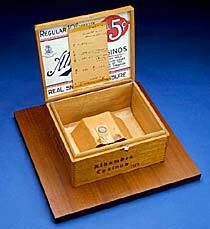 Until Charles A. Spencer began making microscopes in Canastota, New York, in 1838, the only high-quality scientific instruments available in the United States were imported from Europe. Spencer gained fame among American scientists for his fine objective lenses, which provided stronger magnification and sharper resolution than many European models. 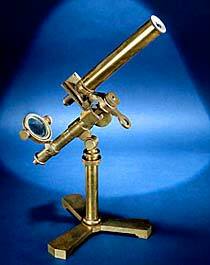 This brass monocular microscope, equipped with a mirror to reflect light through the slide, could be used with either a compound or a simple lens. 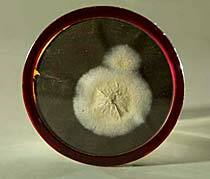 In September 1928, British bacteriologist Alexander Fleming found something unusual growing in his laboratory. Mold had contaminated a plate of Staphylococci, disease-causing bacteria. Where the mold had spread, the bacteria had disappeared. Further research revealed that the mold, Penicillium notatum, produced a substance harmful to microorganisms but relatively nontoxic to animals and humans. During World War II, British and American scientists expanded on Fleming’s discovery to develop the powerful antibiotic penicillin. Jonas Salk used this syringe and these vials of polio vaccine to immunize patients during the vaccine’s clinical trial in 1954–55. Poliomyelitis, or infantile paralysis, was the most dreaded disease in the United States for much of the 20th century. Salk’s vaccine used inactivated, or “killed,” poliovirus to trigger an immune response against the disease. 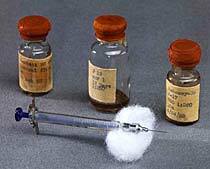 On April 12, 1955, officials announced the vaccine’s success and launched a nationwide immunization campaign. Within a generation, new cases of polio nearly disappeared. 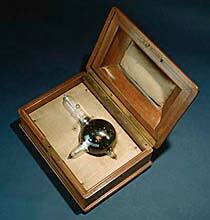 German physicist Wilhelm Conrad Röntgen, the discoverer of X-rays, used this vacuum tube in his early experiments. By applying electric current to the tube, he produced a mysterious type of radiation that could penetrate objects and form images on the other side. Röntgen’s discovery created an immediate international sensation, and physicians quickly adopted the X-ray for medical diagnosis and treatment. “Bone portraits” were also produced as novelties before the risks of radiation exposure were fully recognized. From this microscopic sample of plutonium, scientists working on the Manhattan Project gained knowledge that helped to create the atomic bomb. In 1940, scientists at the University of California at Berkeley transformed uranium into a new radioactive element, plutonium. Further testing proved plutonium was fissionable, meaning it could produce nuclear energy. On July 16, 1945, the world’s first nuclear bomb, fueled by a plutonium core about the size of a baseball, was detonated near Alamogordo, New Mexico. In this notebook, Stanford University professor Stanley Cohen described groundbreaking experiments that produced the first genetically engineered organisms. Together with Herbert Boyer at the University of California at San Francisco, Cohen devised a method for transferring pieces of DNA from one bacterium to another in order to replicate, or clone, particular genes. The discovery sparked excitement over the medical and commercial potential of genetic recombination as well as fears about the ethics and safety of “tinkering” with DNA.